Deposition is the process of applying a material to a base or substrate by means of a vacuum, electrical, chemical, screening or vapor methods, often with the assistance of thermal processing within a controlled atmosphere vessel. 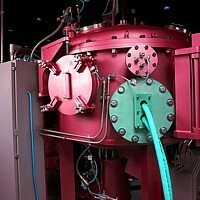 Ajax TOCCO designs and manufactures custom controlled atmosphere deposition systems for a variety of applications. The company specializes in high temperature applications involving induction susceptor heating, as well as process gas monitoring. A coating process whereby the deposition species are transferred and deposited in the form of individual atoms or molecules. Ajax TOCCO designs and manufactures specialized systems for the vapor deposition of many advanced materials in a variety of applications. The company specializes in high temperature applications involving induction susceptor heating and process gas monitoring.